The popular Primo Kamado Round Ceramic Grill All In One Package is Primo’s traditional 18.5” round Kamado style ceramic grill. Primo’s Design creates extremely high cooking flexibility and efficiency that is perfect for grilling, baking or smoking any of your favourite foods. Made in the USA and comes with a Limited Lifetime Warranty backed by a 20-Year Guarantee on the ceramics. This grill includes the cooking grates with the grill body, a heavy duty stand with shelves, and is also supplied with an Ash Tool, Grate Lifter, Heat Deflector Racks & Plates. 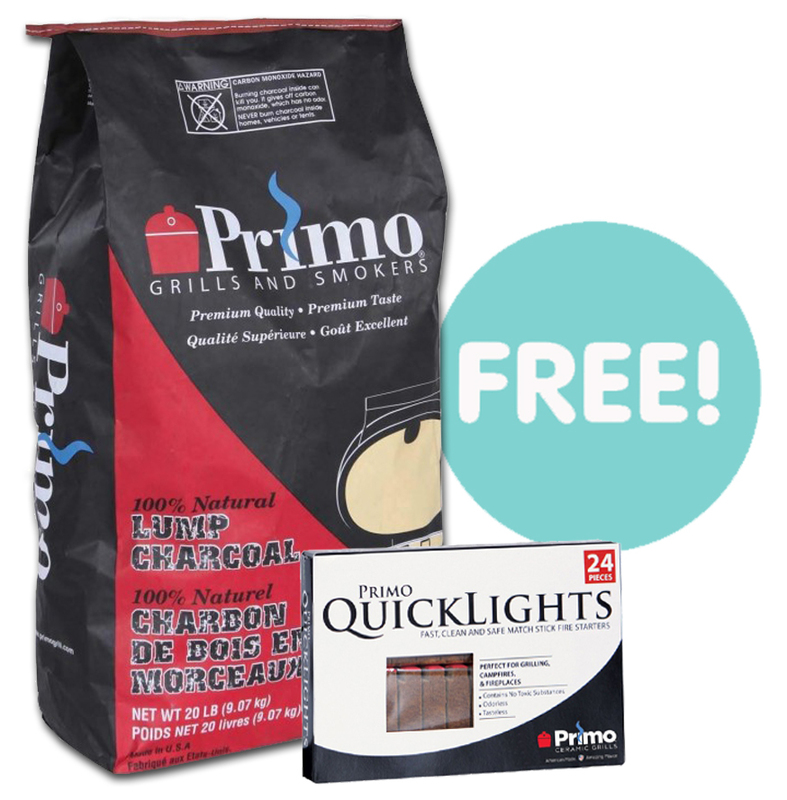 FREE 9kg Bag of Primo Lump Charcoal + Pack 24 Quicklight Fire Lighters worth £40 when you purchase this grill from Qubox. 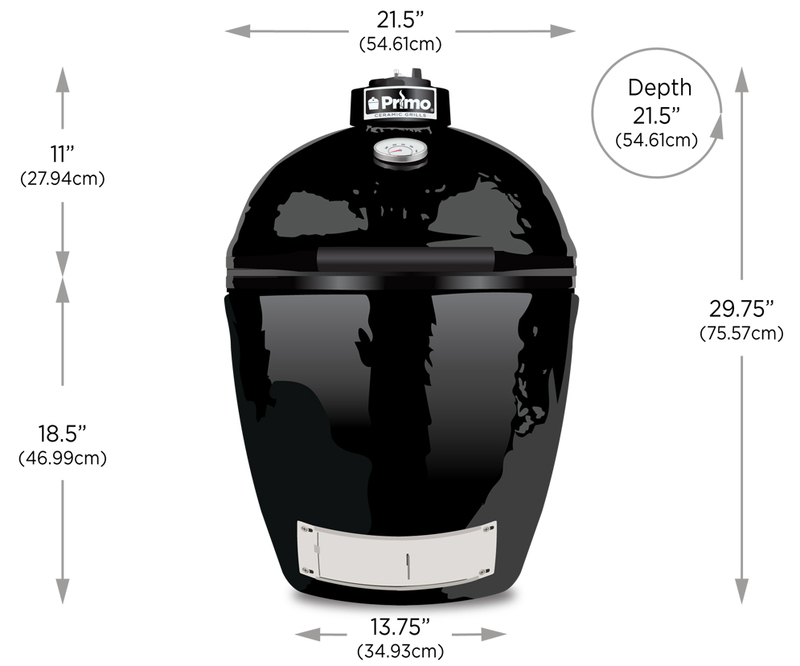 The Primo Kamado Round Grill Package is also available which includes all of the accessories but without the stand and side shelves and is suitable as a built in model. Cooking Area: 1739 sq cm / 280 sq in. 25.4cm (10") of clearance is required behind the grill to open properly and a minimum of 5.1cm (2") of clearance is required around the exterior surface of the grill. The Primo Kamado Round Grill is constructed with premium-grade ceramics and features a large cooking area, cast iron top vent, easy-to-read thermometer, reversible porcelain coated cooking grates and a stainless steel lower draft door. Primo’s Design delivers great cooking flexibility. Grill steaks using the direct method or roast tender foods like fish, seafood and vegetables using the indirect method. The round design creates an extremely efficient cooking space so you can cook more food at the same time. Indirect cooking for baking, roasting and smoking requires the Heat Deflector Racks and Plates. Please note that this model does not feature a Fire Box Divider. This Primo Grill offers exceptional cooking efficiency. Grill, Bake, Roast, or Smoke All on the Same “Grill”. Simply choose a cooking configuration to meet your needs and cook any recipe...from steaks to bread to beef brisket. The combination of the ceramic shell and 100% natural lump charcoal creates juicier food and true wood-fired flavour. Enjoy mouthwatering and delicious food that gas and metal grills just can’t offer. Please note that this model does not feature a Fire Box Divider. This item will be delivered on a pallet via haulier. Click to open the PDF document. Will open in a new window. See the full range of Primo Grills here. Click the button below to add the Primo Kamado Ceramic Grill All In One Package to your wish list.